In an effort to rehabilitate the broken-windows theory, George Kelling recently distanced himself from the tragic deaths of Eric Garner, Michael Brown and others, chalking them to "poor policing." In a post titled "Don't Blame My 'Broken Windows' Theory For Poor Policing", Kelling maintains that his theory was never meant to be a high misdemeanor-arrest policy: "Broken windows was never intended to be a high-arrest program," Kelling writes (his italics). That's hard to believe because George Kelling himself measures broken-windows policing by the number of misdemeanor arrests performed by the police. Kelling made that clear in his 2001 study, "Do Police Matter?" In that study, Kelling tried to prove the efficacy of broken-windows by comparing policing by precinct in New York City. How did Kelling measure broken-windows policing? By the number of misdemeanor arrests. The average NYPD precinct during the ten-year period studied could expect to suffer one less violent crime for approximately every 28 additional misdemeanor arrests made. 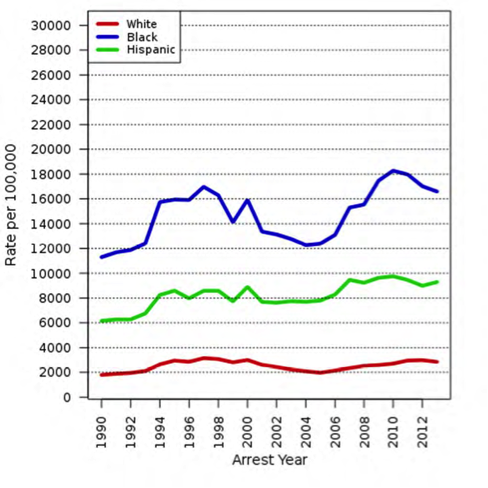 "We thus find," Kelling wrote, "that 'broken-windows' policing, as reflected by arrests for misdemeanor offenses, has exerted the most significant influence on trends in violent crime." Now, Jens Ludwig and I replicated Kelling's study back in 2006 and found that Kelling had failed to include in his analysis, as a control variable, the build-up in crime in each precinct, and thus failed to take account of the most likely explanation for the trends in New York City, namely reversion to the mean. Ludwig and I established that there was no link between the number of misdemeanor arrests and serious crime in N.Y.C. (We found the same results for marijuana arrests a year later). But putting that aside, the point here is that Kelling himself measures the implementation of the broken-windows theory by counting the number of misdemeanor arrests in each police precinct. And Kelling is not alone. NYPD Commissioner Bill Bratton, a champion of broken-windows policing, also uses the number of misdemeanor arrests as the metric to demonstrate the purported success of his broken-windows policies. In a solo-authored report, "NYPD: Broken-Windows and Quality-of-Life Policing in New York City," issued with much fanfare in April 2015, Commissioner Bratton defended the efficacy of his broken-windows approach. 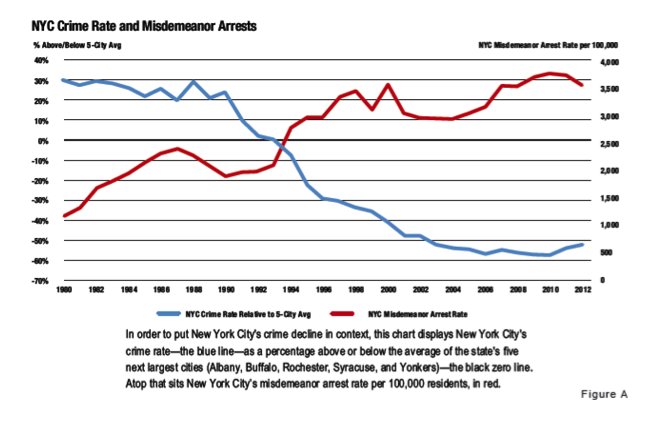 Bratton's Exhibit A: the first graph, on page 2 of the report, is a large "Figure A" that relates the NYC misdemeanor arrest rate to the comparative crime trends in NYC. Let's put aside, again, the reliability of the correlation. 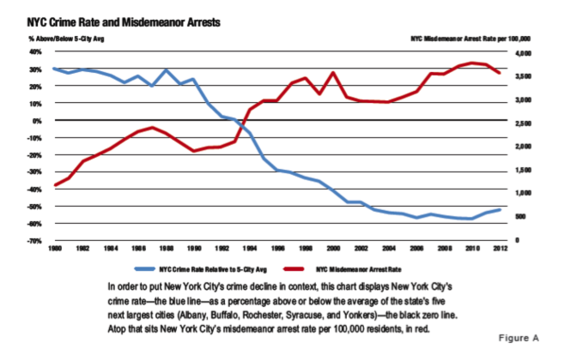 (There are, incidentally, a number of upward trends since the 1980s that we could substitute for misdemeanor arrests in this graph, such as the price of housing in N.Y.C., and we would need to hold constant a number of competing variables if we were conducting a proper study). The important point here is that Commissioner Bratton himself, like Kelling, uses the rate of misdemeanor arrests as the metric to prove the success of his broken-windows approach. 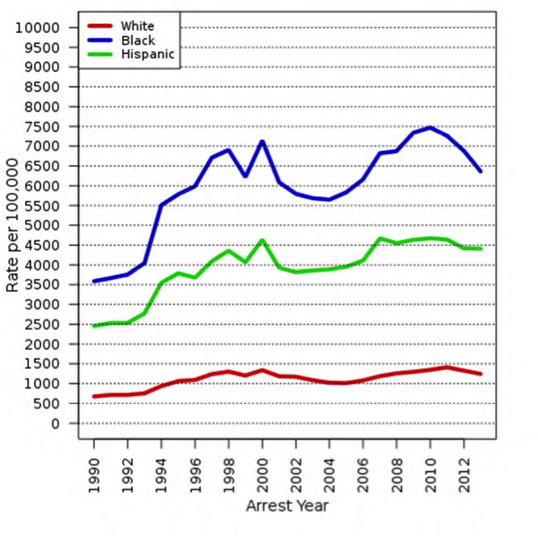 Not surprisingly, misdemeanor arrests have always gone up with broken-windows policing. All this raises a deeper problem at the heart of broken-windows policing: using misdemeanor arrests as a way to fight serious crime aggravates one of the worst problems in our criminal justice system today, namely racial disparities in policing. These disparities are the tragic legacy of decades, if not centuries, of troubled race relations in this country. The figures are a haunting reflection of what Michelle Alexander calls the New Jim Crow. The question we need to pose ourselves today, faced with these racial disparities in misdemeanor arrests, is what to do about them. Do we exploit them and make them worse by increasing the number of misdemeanor arrests using a broken-windows policing approach -- a policing strategy that measures its implementation by the rate of misdemeanor arrests performed? Or, do we try to find ways to reduce the racial disparities that plague our criminal justice system? These figures alone should make us walk away from the broken-windows theory.